Pr e s by te r i a n s To d ay | OCTOBER/NOVEMBER 2017 27 ministry with refugees. According to the Pew Research Center, nearly 85,000 refugees were admitted into the U.S. in the fiscal year ending in September 2016. More than 31,000 were admitted between Oct. 1 and Jan. 24. The crisis took on new meaning with many Presbyterian congre- gations when President Donald Trump signed an executive order in January, suspending refugee admis- sions for a waiting period while security procedures were reviewed. "Right now, more than 65 million people are displaced by war and persecution, and 30 million of those are children. More than 5 million Syrians are now refugees who cannot go to school, tend to their land, or raise their children in the place they know as home," said the Rev. Jimmie Hawkins, director of the PC(USA) Office of Public Witness. "They are spending months journeying, sleeping outside, paying smugglers for safe passage, and praying for a future for their families in a place that is safe from conflict. Our nation has historically stood for hope and welcome for those fleeing war and persecution. We cannot turn our backs on them now." The Farouk family arrived in Washington, D.C., and, to their amazement, received a warm welcome from members of the Chevy Chase congregation. "We arrived here to this foreign land and, thank God, there were people to receive us. We did not know anyone, but they treated us like family," said Adnan Farouk. "There was a sign with the word 'Welcome' written in Arabic for us. They even gave toys to the children so they could be happy after 13 hours of travel." Because their apartment was not ready when they arrived, the four spent two weeks with a church family. "We came here to a foreign country and didn't know anyone. The church became our family. Seriously, we found a second family," said Bana Farouk. A biblical call Willow Grove Presbyterian Church in Scotch Plains, New Jersey, has a long history of opening its arms to people seeking to start anew in the U.S. In the 1970s, the church also welcomed a Vietnamese family escaping the trappings of war in their homeland. Relationships with the family are still strong, according to pastor Cynthia Cochran-Carney. Last year the church welcomed a Syrian family seeking to escape the devastation of war. "I think people here are quite sure what it means to sponsor a family," said Cochran-Carney. "The congre- gation really feels our calling comes from Jesus' words in Matthew 25. If people are hungry, need shelter and come from a place of conflict like Syria, we want to be part of a larger community effort to welcome them." Cochran-Carney was part of an interfaith group that formed Refugee Assistance Partners. The group continues to meet to learn what they have to do to be a host site. 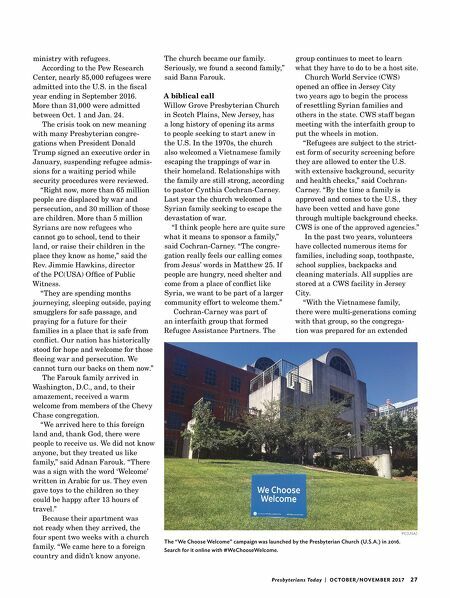 Church World Service (CWS) opened an office in Jersey City two years ago to begin the process of resettling Syrian families and others in the state. CWS staff began meeting with the interfaith group to put the wheels in motion. "Refugees are subject to the strict- est form of security screening before they are allowed to enter the U.S. with extensive background, security and health checks," said Cochran- Carney. "By the time a family is approved and comes to the U.S., they have been vetted and have gone through multiple background checks. CWS is one of the approved agencies." In the past two years, volunteers have collected numerous items for families, including soap, toothpaste, school supplies, backpacks and cleaning materials. All supplies are stored at a CWS facility in Jersey City. 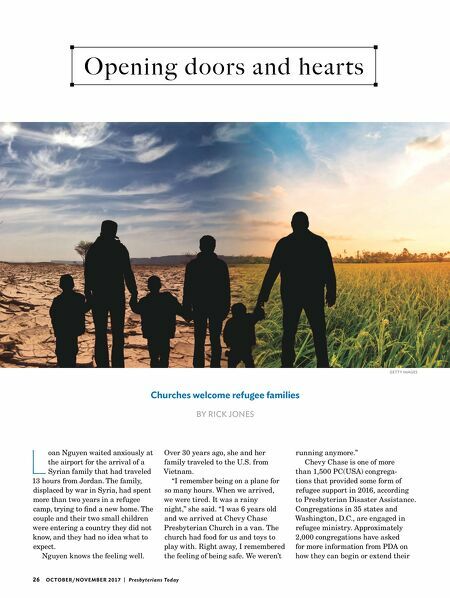 "With the Vietnamese family, there were multi-generations coming with that group, so the congrega- tion was prepared for an extended PC(USA) The "We Choose Welcome" campaign was launched by the Presbyterian Church (U.S.A.) in 2016. Search for it online with #WeChooseWelcome.